Johannesburg: MTN Group Ltd, the South African mobile phone operator that abandoned a $23 billion (Rs1.08 trillion) bid to tie-up with India’s Bharti Airtel Ltd, will seek partnerships or acquisitions in Asia to boost earnings as growth slows at home. “We go as far east as Afghanistan," chief executive officer (CEO) Phuthuma Nhleko said in an interview at the company’s headquarters in the north-western Johannesburg suburb of Fairland. “It would make sense, to the extent that such an opportunity presented itself, to look eastwards. Our natural bent and inclination would always be Africa, the Middle East, and, most probably, opportunities further eastwards." MTN, with operations in 21 countries from South Africa and Nigeria to Iran and Afghanistan, disengaged from four months of merger talks with Bharti on 30 September. With about 75% of its profit derived from four countries, Africa’s largest mobile phone operator is seeking new markets to add customers that will help extend the growth that has more than tripled MTN’s market value in the past five years. The strategic objective doesn’t necessarily change because one transaction doesn’t come to pass, Nhleko said. MTN shares have advanced 7.3% this year, giving the company a market value of 215 billion rand (around Rs1.3 trillion). The push to expand into new markets comes amid mounting troubles for the company at home. Customer numbers declined for the first time and the government is pushing to halve interconnection fees. MTN is also being investigated, along with Vodafone Group Plc’s Vodacom Group Ltd, for anti-competitive practices. In the history of MTN in South Africa we have never really ended a year either contracting or level, he said. It may not be able to replace all 750,000 customers MTN lost in the third quarter by the end of the year, Nhleko said, risking a small decline in market share at home. The main reason cited by MTN on 29 October was a law that requires South African operators to register customer details, such as home addresses and identity numbers. Vodacom CEO Pieter Uys said in July the new law would reduce subscriber numbers. South Africa has a large population of illegal immigrants, and the new rule means the termination of their accounts. Nhleko said the contraction in MTN’s home market is an indication that there is definitely a step change in the industry. Subscriber growth in South Africa for MTN, where mobile phone networks span almost the entire country of 48.5 million people, at least 85% of whom buy airtime in advance, probably won’t exceed 10%, Nhleko said. “In the first half of the year, we were not as aggressive as our competitors on the pre-paid side," he said. We have pushed very hard in the second half and we’re continuing to push hard. South African mobile operators are also being pushed to cut the fees they charge to carry each other’s calls. Last week, MTN and Vodacom offered to cut these by 19% to 78 cents. The South African government wants it reduced to 60 cents a minute. Growth becomes more difficult as a company gets larger, Nhleko said. “As you become bigger and bigger it becomes more of a challenge to grow, that is where innovativeness and lateral thinking capacity in management becomes important," he said. Growth in this sector will certainly be in emerging markets. MTN will consider growth through partnerships. “We’re not saying value accretion and growth will come merely from M&A (mergers and acquisitions)," he said. “It is important, but we do have a constant iterative process as to how we lower our cost base to ensure the organic growth continues," he said. Size does count in this sector, it is one of those sectors that are very much economies of scale driven. MTN is not drawn to Latin America, because it is dominated by large companies such as America Movil SAB, or Russia, where, like South Africa, the market is too saturated. “MTN holds significant market share in the countries in which it operates and has invested in its networks. That puts us in good stead to weather any competition," Nhleko said. 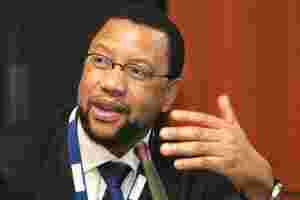 In Nigeria, MTN increased its market share to about 49% from about 44% as rivals pared spending, he added. Most of the licences in large countries are third or fourth licences, making it difficult to build a robust business case, he said. It is becoming more difficult. Ethiopia and Angola are countries MTN would be interested in should they decide to issue licences. While Nhleko admits there is some urgency to conclude a transaction to bolster its size against its rivals, a deal cannot be done with indecent haste. The failed Bharti transaction has not made MTN a target for a hostile bid, Nhleko says. “With a company this size, anything that is done, is done by mutual and amicable understanding between parties," he said. “Any other way is unlikely to work. I certainly do believe more people are aware of MTN than before."